Featuring interviews with media analysts and cultural historians, this documentary examines the patterns inherent in TV's disturbing depictions of working class people as either clowns or social deviants -- stereotypical portrayals that reinforce the myth of meritocracy. 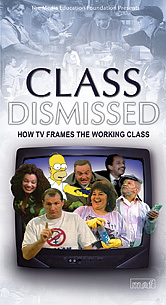 Class Dismissed breaks important new ground in exploring the ways in which race, gender, and sexuality intersect with class, offering a more complex reading of television's often one-dimensional representations. The video also links television portrayals to negative cultural attitudes and public policies that directly affect the lives of working class people. Featuring interviews with Stanley Aronowitz, (City University of New York); Nickel and Dimed author, Barbara Ehrenreich; Herman Gray (University of California-Santa Cruz); Robin Kelley (Columbia University); Pepi Leistyna (University of Massachusetts-Boston) and Michael Zweig (State University of New York-Stony Brook). Also with Arlene Davila, Susan Douglas, Bambi Haggins, Lisa Henderson, and Andrea Press.